The Mubadala Silicon Valley Classic lost its second former world No. 1 in less than 24 hours today. This one didn't even hit a ball, as top-seeded Garbine Muguruza withdrew with a right arm injury. 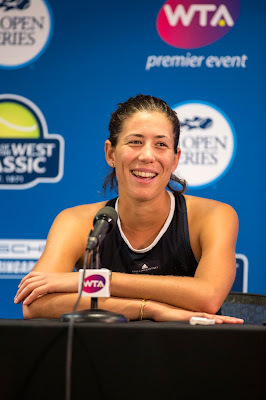 "I've been feeling some pain in my right arm for a couple of days and realized I am not ready to play the match," the seventh-ranked Muguruza said. "I am very sorry for the fans and the tournament. Hopefully I can recover for the next events." Muguruza, who received a first-round bye as one of the tournament's top four seeds, was supposed to play unseeded Victoria Azarenka tonight at 7 in a matchup of former top-ranked players and two-time Grand Slam singles champions. Azarenka, who won the 2010 Bank of the West Classic at Stanford, instead crushed 19-year-old Russian Anna Blinkova 6-1, 6-0 in 58 minutes. Muguruza's withdrawal followed sixth-seeded Serena Williams' 6-1, 6-0 loss to Johanna Konta of Great Britain on Tuesday night. Konta, the champion of the 2016 Bank of the West Classic, defeated Sofia Kenin, a 19-year-old American, 6-1, 6-4 today to reach the quarterfinals. Kenin, who was born in Moscow and moved to the United States as a young child, won the $60,000 Berkeley Tennis Club Challenge two weeks ago. Also advancing to the quarters were fourth-seeded Elise Mertens of Belgium and unseeded Danielle Collins of St. Petersburg, Fla. The 15th-ranked Mertens, an Australian Open semifinalist in January, beat Ashley Kratzer, a 19-year-old wild card from Newport Beach, 6-2, 6-0. Kratzer reached the Berkeley semifinals. Collins, a semifinalist at Miami as a qualifier in March, topped Vera Lapko, 19, of Belarus 6-1, 3-6, 6-1. On Thursday, second-seeded Madison Keys is scheduled to play Ajla Tomljanovic of Australia at about 3 p.m., and third-seeded Venus Williams is set to meet Heather Watson of Great Britain at 7 p.m.
Keys won last year's Bank of the West Classic, and Venus Williams took the 2000 and 2002 crowns. In the first round of doubles, fourth-seeded Miyu Kato and Makoto Ninomiya of Japan edged Magdalena Frech of Poland and Maria Sanchez, a 28-year-old Modesto product, 1-6, 7-5 [10-4]. Here are the Mubadala singles and doubles draws and Thursday's schedule.